Like many No Kill stars, Teresa Johnson came to animal sheltering from a high-status, high-paying professional career. Her job before she became a shelter manager was as vice-president in charge of risk management and control for J.P. Morgan in Kansas City, Missouri. She worked with businesses to make sure that they were protected from fraud and asset loss. During the 12 years that she worked with J.P. Morgan she was also volunteering for animal welfare issues. For many years she was president of the board of a large private humane society and helped shepherd it through a rapid growth phase and the building of a new shelter. In 2009, when the Great Recession hit and the financial world was thrown into chaos, Teresa’s position with J.P. Morgan was one of the casualties. Rather than look around for another job in finance, Teresa decided to use the opportunity to do what she really wanted to do, which was help animals. She took a job as the Chief Operating Officer (COO) at a local organization called Animal Haven. She was there for two years, during which time Animal Haven merged with a spay-neuter clinic and became the Great Plains SPCA. Then in 2011 Teresa’s career took yet another turn. The public shelter in Kansas City, which was run by the city through a contractor, was high-kill. Local animal welfare activists had worked for years to change that, and with their help the city shelter had increased its live release rate from 34% in 2006 to 68% in 2011. In early 2011, a scandal involving allegations of poor animal care by the contractor running the shelter led the city to terminate the contract. The city put out a request for bids for a new contractor, but it got no responses. Early in November of 2011, after negotiations over financing, the city council approved KCPP’s bid on the shelter contract. The start date was January 1, 2012. The small group of people who had taken this audacious step had less than two months to prepare to run an open admission city shelter that at that time was taking in about 6,000 animals per year. KCPP hired Kim Staton as Executive Director and Teresa as COO. Teresa spent the month of December 2011 hiring people to work at the shelter. The city had run the shelter using a combination of animal control officers, employees of the previous contractor, and a handful of permanent employees. Animal control was moving to another building and the previous contract agreement with the city was expiring, so Teresa was able to hire a team of new people. She went for a non-traditional work force. In fact, the new hires were so non-traditional that Teresa was the only one who had ever actually worked in an animal shelter. Although the first day of the new contract was the New Years Day holiday, KCPP decided to have their grand opening that day as a symbol that it would not be business as usual with them. It was a huge success, with crowds of people visiting. Opening for most holidays is now a tradition for the shelter, which is open every day of the year except for Christmas and Thanksgiving. Then, to complicate things, Kim Staton left KCPP after four months on the job. Teresa became interim director and eventually was selected as the new Executive Director. It was a challenging transition period with an organization that was still getting its feet on the ground. As Teresa says: “I don’t think we really realized what we were in for.” They were spectacularly successful, though, reaching a 90% live release rate within six months of their start date. One of Teresa’s first priorities was to establish an offsite adoption venue. The city shelter was housed in a 40-year-old building near the landfill, behind two sports stadiums, in an area with no visibility to potential adopters. Teresa went big, finding a large, central space in Zona Rosa, a high-end retail center that is across town from the shelter’s location. She found a donor who paid the first year’s lease. She negotiated with a local supplier to get the center outfitted. When all was said and done, she had a premier retail space to feature the shelter’s pets at a minimal cost. The Zona Rosa site recently had its 3-year anniversary, with over 5,000 adoptions to its credit. KCPP has also opened a second large offsite adoption venue in a Petco store. Teresa improved the main shelter building by making it less institutional and more welcoming. They got rid of the bulletproof glass in the lobby, and volunteers landscaped the property. Once inside the shelter, prospective adopters experience an open, dialogue-based approach to matching them with a compatible pet. Teresa wants to give people lots of reasons to come to the shelter, so they have adoption specials and fee-waived events. There has been discussion with the city about replacing the old shelter but nothing definitive has been done yet. KCPP’s contract is administered by Animal Control. There is no ordinance preventing cats from being free-roaming, but Animal Control will pick up stray or feral cats when they get a complaint. These nuisance complaints have caused some problems between the city and feral cat colony caregivers. KCPP is trying to work with Animal Control and the city to get them to embrace TNR, but in the meantime all the feral cats that Animal Control brings to the shelter have to be relocated. They never euthanize a cat for being feral. One of the most amazing things in the amazing story of KCPP is that they have been able to maintain a high live release rate even as their intake has climbed each year. Last year their intake was almost 9500 dogs and cats. In spite of having to place so many more animals, they have continued to have a 92-93% live release rate each year. The high intake means that Teresa and her team must concentrate on keeping animals moving. In addition to their adoption efforts they have two full-time foster coordinators and a rescue transport placement coordinator. Their total payroll is about 90 people, up from 20 on the day they started. When KCPP took over the city shelter they inherited a tiny veterinary clinic that, at about 400 square feet, did not have anywhere near the capacity needed for a large No Kill shelter. With financial assistance from Petco Foundation and the community, they opened a modern veterinary clinic on the shelter property a few weeks ago. This allows KCPP to treat the injured and ill animals brought in by Animal Control in-house rather than having to outsource veterinary care. The situation in Kansas City is similar to the situation in Atlanta in some respects. 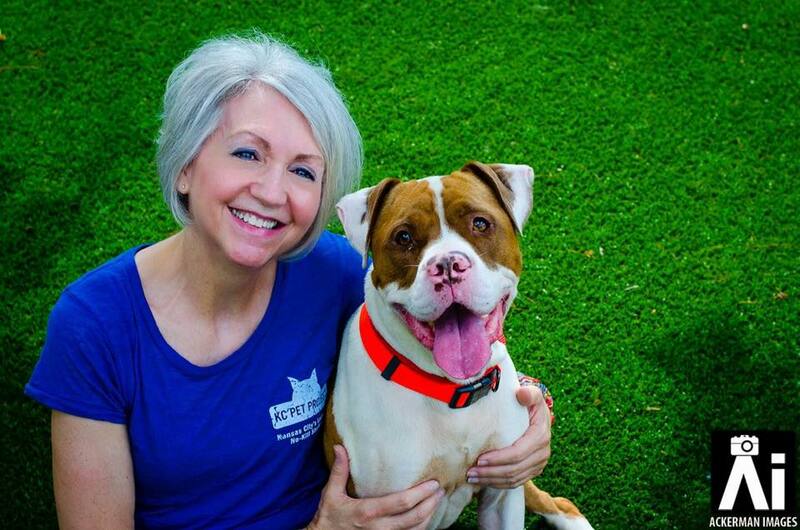 In each case a non-profit formed by No Kill advocates took over the city shelter and dramatically increased shelter lifesaving, without the benefit of the type of local coalition we have seen in cities like Austin, Jacksonville, and Richmond. In both Kansas City and Atlanta shelter managers are also dealing with badly outdated buildings in out-of-the-way locations. In Kansas City the shelter has had to deal with the additional problem of intake that has grown rapidly. Teresa enjoys the challenges and the fast pace of the work. The KCPP team’s motto is “solutions not excuses.” An example of this motto in action was their approach to saving parvo puppies before the new veterinary clinic was opened. They converted a narrow old locker room into a parvo ward and saved 90% of puppies with parvo. KCPP is now winding up its fourth full year of running the city shelter. Congratulations to Teresa and the entire KCPP team for taking a big risk and making an outstanding success of it. TERESA JOHNSON YOU ARE AN ANGEL… AS WELL AS ALL THE OTHERS HELPING TO MAKE KILL SHELTERS INTO ”NO KILL SHELTERS”… HOW DO WE GET ALL THE KILL SHELTERS TO BECOME “NO KILL SHELTERS”.? SUGGESTIONS PLEASE… THANK YOU. I WOULD LOVE TO HELP MAKE THAT HAPPEN. This is a great start. However I noticed that your intake is increasing each year. The only way to ever completely irradiate overpopulation/kill shelters is to spay/neuter ALL animals. Eliminate ALL puppy/cat mills. ALL backyard breeders eliminated. Hugh fines if caught. If you want to breed a specific animal you must go through strenuous scrutiny and pay for a license. THIS IS HOW GERMANY COMPLETELY SOLVED ALL OF THE ABOVE PROBLEMS.